Gov. Eric Holcomb spent weeks during his first year as governor in Hungary, France, Japan and India pitching to international companies the prospect of investing and expanding in Indiana. Holcomb and his top economic development official, Commerce Secretary Jim Schellinger, traveled to 11 countries and 31 cities in 2017. The Indiana Economic Development Corp. said those efforts resulted in 40 trade deals that came with promises to create 5,607 Indiana jobs and $1.87 billion in capital projects. That’s more than double the results from 2016, when then-Gov. Mike Pence went on no trade missions. That year, the state garnered 36 projects promising 2,648 jobs and $818 million in capital investment. For Holcomb, the renewed emphasis on international trade is a result of his competitive spirit—he pointed out to IBJ that he was miffed that two other U.S. governors beat him to India last year—and an appreciation for other cultures that he fostered while serving in the 1990s in a multinational joint command as a member of the U.S. Navy in Lisbon, Portugal. “You don’t just negotiate deals on American soil,” Holcomb said. “It’s a two-way street. And I think the states that get this are more successful—the folks that play the ball and don’t just wait for the ball to come to them. Holcomb is not the first Indiana governor to focus on international trade. The influence of foreign direct investment and the governor’s role in shepherding those deals have been growing for decades. One of the early successes was the state’s luring of the $500 million Subaru-Isuzu auto plant to Lafayette in 1986. The plant—now owned solely by Subaru—has grown explosively and employs more than 5,000. It was the first of three major Japanese auto plants to open in the state. Toyota opened in Princeton in 1998, and Honda launched in Greensburg in 2008. Decades later, with 800 foreign-based businesses employing nearly 200,000 Indiana residents, few question the state’s strategy of globe-trotting for jobs. 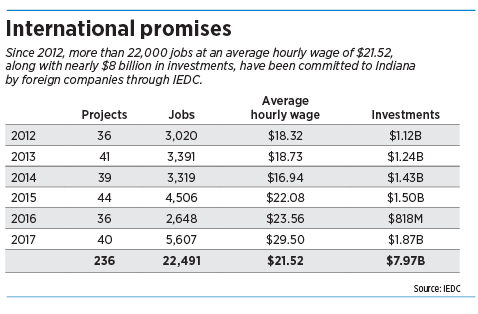 According to IEDC, Indiana has the highest percentage of private-sector jobs from foreign-owned firms in the Midwest, and Holcomb said opportunities abound to do even better. The governor said he envisions partnering with technology firms to further build up the state’s major industries—“ag plus tech, auto plus tech, RV plus tech, limestone plus tech, you name it. It’s also what foreign governments expect. Tiffany Shackelford, chief strategy officer for the National Governors Association, said there’s been a “really interesting pivot” in international economic development. It used to be that foreign governments went to Washington, D.C., to connect with the United States. “Now, they go to Columbus, to Indianapolis, because that’s really where the relationships are. That’s where the action is,” she said. To hear Schellinger tell it, the largest economic development deal in Indiana history—outsourcing firm Infosys’ announcement that it will bring 2,000 jobs to the state—came nearly on a whim, the result of a mutual friend and a whirlwind of international trips. In February 2017, a group from Infosys came to Indiana and were introduced to Schellinger through a mutual friend. Schellinger learned they planned to build innovation centers in the United States, and he “pitched Indiana as best we could” and introduced the group to Holcomb. In early April, Schellinger said, the group came back to Indiana to “meet with the governor again and further discussions.” And on May 2, the announcement was made. Schellinger said the state’s responsiveness and quick travel to address Infosys’ board were how Indiana secured the deal. But most deals aren’t negotiated on a whim. The decisions on where Indiana officials go on trade missions—and when—are strategic. “I don’t see it as much as exploration as I see it as developing relationships and looking at where our interests and [those of] others align,” Holcomb said. In India, it was about exploring how Indiana and the South Asian nation could collaborate technologically. In Hungary, Holcomb said, the central European country and Indiana have a “shared manufacturing history” and it is an emerging market. IEDC spokeswoman Abby Gras said Indiana officials’ efforts have helped raise awareness around the world that the state is an attractive place to set up operations. Schellinger travels to further those negotiations or “share Indiana’s story at the most prominent places … where the ability to turn leads into negotiations is higher,” Gras said. 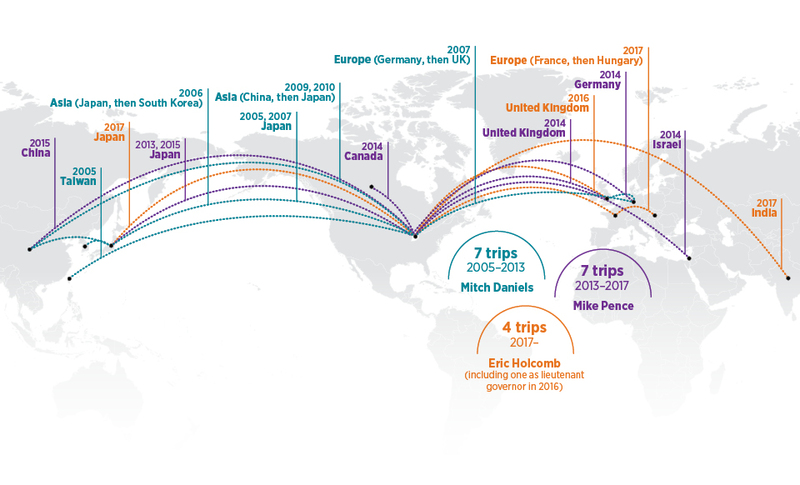 Last year, the 10 trips to 11 countries cost a combined $809,500, according to IEDC, all of which were paid for by the private IEDC Foundation, also called the Works Foundation. The foundation is funded by such donors as Vectren, Duke Energy, Indiana Michigan Power, IPL, NIPSCO, Old National Bank and Hoosier Energy. IEDC declined to break out costs per trip. What did Indiana get from the travel? Some cases are clearer than others. For instance, in June, Schellinger and IEDC staff went to the United Kingdom to engage in confidential negotiations—the results of which still aren’t clear. Sometimes, results are announced almost immediately. In October, while Schellinger was in Germany, IEDC reported after meeting with a German company, Ludo Fact GmbH, that the company would expand its Lafayette operations, creating up to 75 jobs and investing $13 million over five years. His firm’s German leaders “felt welcomed” in their meeting with Schellinger, Huber said. In other cases, it might be months after a trip before the public knows results. For example, the governor and his staff met with the Japanese company Aisin Seiki, parent firm of Aisin Drivetrain, during his Japan trade mission in September. IEDC announced in February—five months later—that the firm would invest $16 million and add up to 47 jobs in its Crothersville facility in Jackson County. Powell, the IU Kelley School of Business associate dean, said going overseas to build relationships is worth it even if results aren’t immediate. Powell said Holcomb’s travel log shows he’s thinking more creatively about the task of international trade than some leaders. While Gras said the governor hasn’t finalized his travel plans for 2018, Schellinger is off to a busy start. He traveled to Hungary and the Czech Republic in January, and Gras said he has tentative plans to visit Canada, Germany, Italy and Switzerland. Schellinger said IEDC is planning a European trip for Holcomb. The governor himself has mentioned going to China and Slovakia.